THIS IS THE OFFICIAL BLOG OF THE DEPARTMENT OF SOCIOLOGY, SOUTH ASIAN UNIVERSITY, NEW DELHI. IT CONTAINS INFORMATION ABOUT THE DEPARTMENT AS WELL AS NEWS ON REGULAR EVENTS HOSTED BY THE DEPARTMENT. IF YOU ARE INTERESTED IN FURTHER INFORMATION, PLEASE FEEL FREE TO CONTACT US BY TELEPHONE, EMAIL OR REGULAR POST. Image: Courtesy of Dev N. Pathak, Sociology, SAU. Over the last half century or so, a vast body of knowledge(s) on the region has evolved within South Asia that mostly remain within the countries of their origin due to a number of reasons. In this specific context, there is a crucial need to share some of this knowledge in contemporary times when, despite assertions of localisations and mini-narratives, the universal does retain its emphasis through a constant dialectics of the two. The debate between the local and universal or mini-narratives and meta-narratives continue to rage, and is more clearly visible in the context of South Asian context. Even so, we are acutely aware of the non-existence of regular and serious forums for South Asian scholarship in social sciences to showcase our own research and thinking. We are also quite conscious of the fact that the process of establishing sociology in the region has created its own peculiarities which has established close inter-relationships between sociology and social anthropology, history, cultural studies, archeology and other related disciplines. 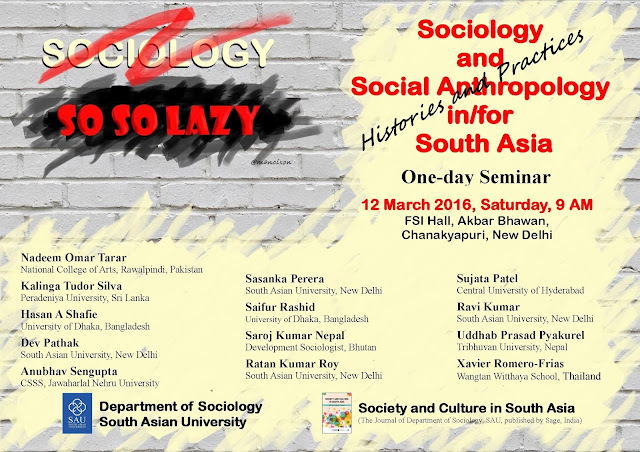 We consider the porousness of South Asian sociology one of its most enduring strengths. On the other hand, we are not unaware of the unfortunate regressions sociology has experienced in different South Asian contexts over the last 30 years or so marked by numerous institutional failures. 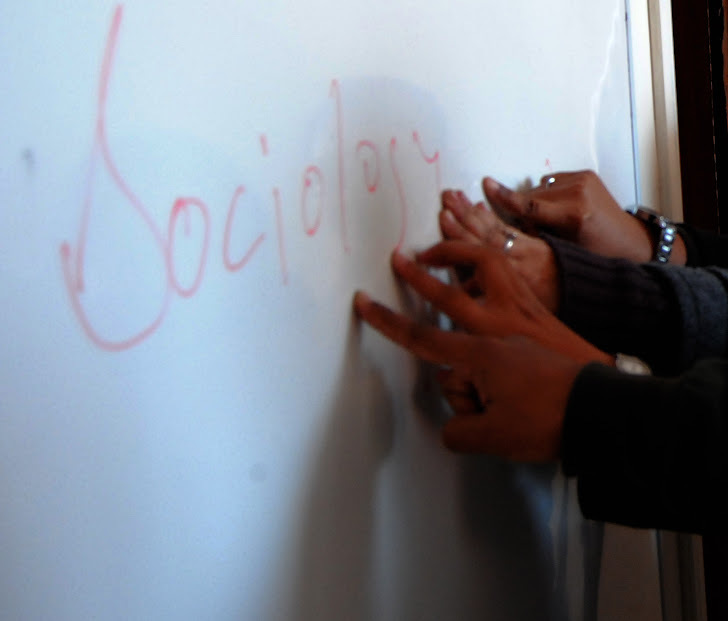 It is within the context(s) outlined above that the Department of Sociology at South Asian university, initiated in 2011 witihn the Faculty of Social Sciences contributes to teaching, training and knowledge production. It is not intended to be a mere forum for the production of cutting-edge intellectual knowledge and exchange of that knowledge traversing across national borders in South Asia and beyond. Our expectation is that this knowledge would dislocate the persistence of an imposed framework emanating from the colonisation process and postcolonial politics of knowledge. Despite the passage of over fifty years since the process of official decolonization began in the region, much of the analyses of our problems, situations, histories and dynamics emanate from Euro American academia; this is certainly the case when it comes to conceptual formulations and theoretical approaches that are being employed in exploring the region’s social and cultural complexities often without much self-reflection. The Department of Sociology strongly believes in the need to reformulate this situation by effectively centering South Asia without naively shunning thought from these established centers of knowledge be they in Europe or North America. We believe in an active and robust engagement with these issues within South Asia. In this context, through the work of its faculty and the research of graduate students, the Department would bring forward the newer forms of knowledge that comprehends and represents the South Asian context with a more authoritative and nuanced voice. We strongly believe in the need to actively intervene in the process of knowledge formation through a constant sharing of knowledge that the region produces as well as through interaction with the world beyond the region. Class of 2011, Department of Sociology, South Asian University; Image: Courtesy of Dev N. Pathak, Sociology, SAU. As a critic of modern civilization Gandhi was deeply suspicious of its desire for universality. While universal ideals like freedom, therefore, were enthusiastically taken up by many anti-colonial thinkers, the Mahatma focused instead on their darker aspects and links with imperialism. And yet he refused to become a partisan for the particular either, recognizing it as a category belonging to the universal as well. Hinduism provided Gandhi with an important example of a phenomenon that he thought might avoid the violence of the universal while at the same time denying relegation to a mere particularity. This lecture will explore how Gandhi posed Hinduism against what he saw as the violent appeal to humanity as a universal ideal, looking in particular at his understanding of three contentious issues: caste, conversion and cow protection. Organized by the Faculty of Social Sciences, South Asian University in collaboration with the Department of Sociology, SAU, Society and Culture in South Asia and India International Centre. History is an inescapable process. As human beings, our bodies are inscribed with connotations that in many ways defy temporalities of existence. But our historically marked bodies dwell in a present with a desire to invent the future. Human beings’ desire to root themselves to a place and space where identity, communality and belonging matters to a great extent, and the urge to trace historical trajectories to know the ‘true’ past has obsessed humankind. 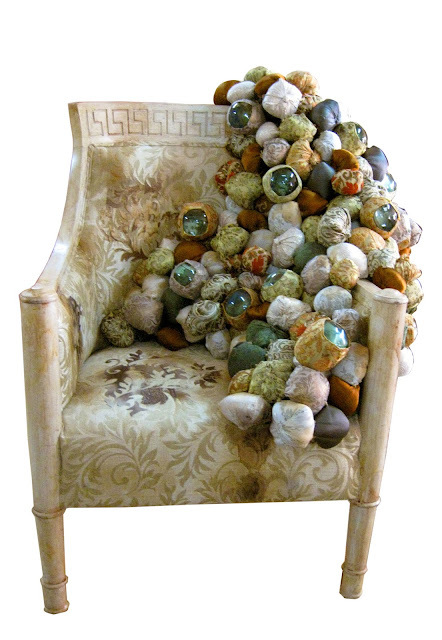 Within the discourse of visual art, artists have been unhesitating in interrogating history in the collective and individual memory, and often their interventions and engagements with historicity and remembrances have brought out narratives of resistance, voices of disquiet and foreboding aesthetics where the society is made not to forget. In this process, history is interpreted, recounted and mediated within their artistic personalities and particular intentions. In the hands of artists, temporality is extended, made to suspend or warped thereby letting history lose its linearity of progression. Allegory and metaphors in their aesthetic exercises add layers to the already subjective memories and selective histories framed via multiple interpretations. Each of the participating artists in this exhibition has tried to capture a portrait of a nation whose historical trajectory has gone through strained moments that are heavy with colonial legacies, homeland claims, armed conflict, autocratic rule and polarized ethnic politics. Jagath Weerasinghe, Anoli Perera, Bandu Manamperi, Pala Pothupitiya, Anura Krishanta, Pradeep Chandrasiri, Pradeep Talawatte, Thisath Thoradeniya and Pushpakumara Koralegedera. Society and Culture in South Asia (the journal of the Department of Sociology, South Asian University, co-Published by Sage India) in collaboration with 'Rickshaw - A Students’ Collective' at Department of Sociology, South Asian University present, ‘A Conversation with Shiv Visvanathan’. Date and time: 23 September 2016, Friday, 2:30 pm -5 pm. 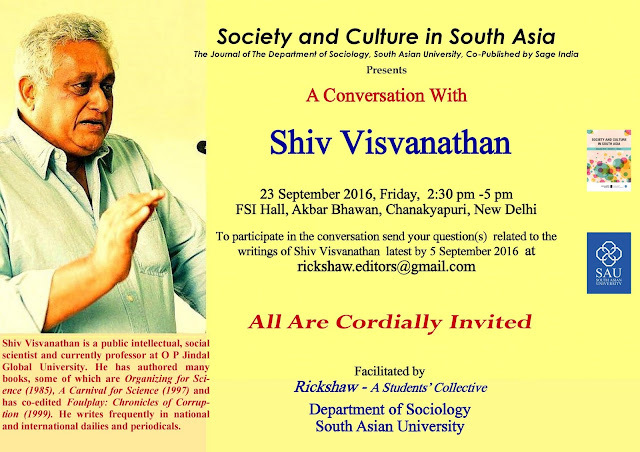 Venue: FSI Hall, Akbar Bhawan, Chanakyapuri, New Delhi. Particularly in the West, there have been numerous studies of youth ‘cultures’ and ‘sub cultures’, and the lives of youth as refracted by class and ethnicity, space and place, gender and sexuality, media, the politics of multiculturalism, artistic production and forms of consumption. By contrast, youth has not historically been a central category in South Asian sociology. However firstly, recent demographic changes have forced South Asian scholars to rethink youth as a category. According to statistical reports, across South Asia, youth (defined as those below 25) form at least 40 percent of the total population of any South Asian country, with the numbers ranging from 40 % at the lowest in Sri Lanka to almost 65% in Afghanistan at the highest (Wadley 2015: 14-15). Secondly, and more critically, as authors like Mark Leichty (1995) write, the younger generation appears to be coming to age in often completely new socio-economic and political circumstances, from the generation before. In this context, an emergent literature suggests that the youth are critical to any understanding of the future trajectory of South Asian nations, particularly in relation to 1) education, work and employment, 2) mass consumption, media and new technologized networks, 3) politics and social movements, as well as 4) gender and sexuality, in terms of new gender conventions and subventions, as well as new forms of sexual engagements. Youth as understood here, is not a fixed category defined by age, but in many ways is the “beginning of a long-term, even lifelong, engagement in particular cultural practices” (Bucholtz 2002: 526). Youth should be treated as social and political actors in their own right. Thus, youth geographies, as we understand them, can be understood as sites of transition, engagement and re-creation of existing, and emergent, structural socio-economic, political and cultural conditions. The conference focus here is on understanding structural conditions, representations, experiences and meaning, as well as the practices of youth individuals and communities themselves, including within new political economies of work, education, and employment, mediatized, technologized, lifestyle and consumptive dispensations, as well as political and social movements. We are interested in considering new forms of engagement, self-fashioning, experimentation, negotiation and sociality, in relation to the above, including the emerging contours of young gendered and sexual lives and conduct, while welcoming papers on other relevant topics. We believe that youth, and young scholars by extension are uniquely positioned to conduct research with youth communities, perhaps with better access than that available to older, and more experienced scholars. In this sense, the Young Scholars Conference, particularly on this theme aims at incubating vital scholarship in the South Asian context. Papers are invited from candidates in MA and MPhil/PhD programs in the arts, social sciences and humanities at recognized universities and research organizations in South Asia. We also welcome contributions from individuals who are currently not enrolled in any university provided no more than one year has passed since their graduation from at least an MA programme. Authors of selected abstracts will be informed by email by August 1 2016, and complete papers have to be submitted for plagiarism review by October 1 2016. As part of the programme, we will have one screening session and one panel devoted to digital media forms produced by young practitioners themselves. Applicants interested in submitting their media forms (short films, video installations, podcasts, photography, websites/blogs etc.) should include a sample of their work, along with a written abstract, by the above deadlines. The subject of the email should be: SOC-FSS-SAU-Young Scholars and Researchers Conference 2016. For those interested in submitting media-based work, along with abstract, please send a synopsis of the work, along with a media sample and/or 5 minute trailer. South Asia here denotes India, Pakistan, Afghanistan, Nepal, Bangladesh, the Maldives, and Bhutan. The fourth instalment of the annual lecture series hosted by the Faculty of Social Sciences, South Asian University will be held on Friday, the September 02, 2016 at Seminar Rooms, 1, 2 and 3 at the Kamla Devi Complex, India International Center. 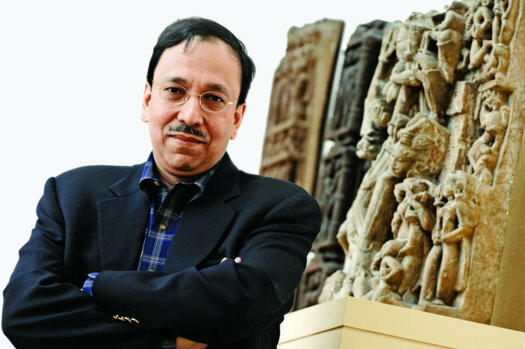 In his work, Prof Bose focuses on modern South Asian and Indian Ocean history. 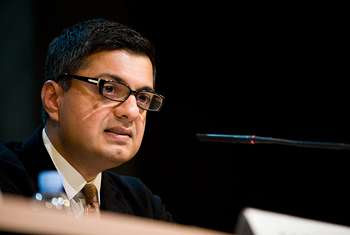 His books include His Majesty's Opponent: Subhas Chandra Bose and India's Struggle against Empire (Cambridge: Harvard University Press, 2011) and A Hundred Horizons: the Indian Ocean in the Age of Global Empire (Cambridge, MA: Harvard University Press, 2006.) Of interest to scholars working in the intersections of sociology, history and political studies is Prof Bose’s attempt in A Hundred Horizons to transgress area studies and other disciplinary frontiers to link issues of culture with political economy. 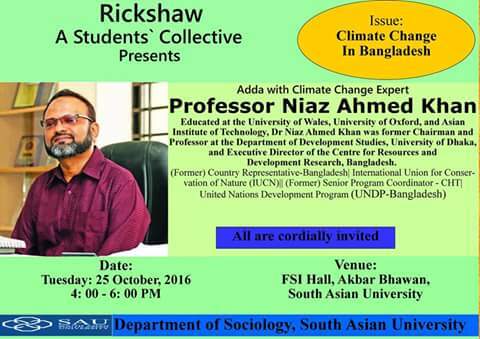 The event will facilitated by Society and Culture in South Asia and the Department of Sociology, South Asian University. This blog is maintained by the Department of Sociology, Faculty of Sciences, South Asian University. Department of Sociology, Faculty of Social Scinces, South Asian University. Travel theme. Theme images by Barcin. Powered by Blogger.